29-May-2009 -- Continued from 37N 31E. The confluence point 41N 25E is located in the north east of Greece, about 20 kilometers south east from Xánthi, near the coast. It is very easily accessible. Our big holiday trip from Cyprus to Germany lead us through a hand full of countries. This gave me the opportunity to visit some confluence points. I planned to reach at least one in each country. The second candidate was Greece. After passing Turkey we entered Greece at the frontier station of Kipi. Along the coast, direction west, we visited Alexandroúpolis and many small villages until we reached the Lágos Vistonida. There we saw the beautiful monastery of Ágios Nikólaos, short before reaching Lágos. There I was not sure whether the aimed CP was located in the sea or not because I had no printout from the confluence.org website. So I switched on my GPS and we followed the arrow at the screen. I was very happy to see a road in front of me, which was leading straight to the CP. The road was missing the point only few hundred meters. So we took the road into the village Mándra. We didn't have to go into the center of the village because the CP was located in the east of it and came into the village from south east. Next to a large storage area made of concrete and not far from some farmer buildings, I parked the car and went out fully equipped. It was raining and quite dark for the time of the day. I became wet quite soon – well: not fully equipped at all! I went down a little slope, which had grown small brushwood all around, for about 200 meters and was at the confluence point already! With a good 4WD it should be possible to visit this CP even without stepping out of it! But nevertheless I had to fight with the raindrops on my display. Later on I was happy having the picture of the correct GPS coordinates, but not very sharp. Unfortunately, I didn't have a second chance to do it in better quality. I ran around several minutes and all I got was wet feet! I add a second picture with a better view of the coordinates but with a one at the last digit for north. So I did the pictures of the directions and the location. 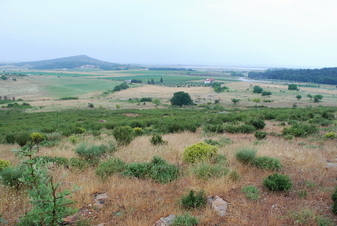 I was very glad to visit my first confluence point in Greece on 29 June 2009. Unfortunately, there was no other possibility to visit a second one in this state during our trip. Let's see what the future brings! Confluence point 41N 17E shall be the next!